동전 뒷면은 아우구스투스 세인트 고든스가 전체적으로 연출한, 머릿결을 흩날리며 왼손에 올리브 나뭇가지를 들고 오른손에 횃불을 든 레이디 리버티입니다. 배경에는 국회의사당이 있습니다. 레이디 리버티를 떠오르는 태양과 50개의 별이 원모양으로 감싸고 있습니다. The words "LIBERTY" and the year are also on the face of the coin. 앞면 Rendition of Augustus Saint-Gaudens Lady Liberty, and the word "LIBERTY" and the year. 1/4 oz Random Year American Eagle Gold Coin 이 미국독수리 금화는 1985년 금 불리언 동전 규정의 승인을 받았으며 1986년 처음 출시되었습니다. 이것은 1/10, 1/4, 1/2, 1트로이온스의 사이즈가 있으며 각 동전은 미국 정부가 보유 중량과 순금임을 보증합니다. 독수리 동전은 22캐럿(ct) 금이며 91.67%의 금과 8.33%의 구리로 보다 튼튼하게 주조되었습니다. This combination is traditionally referred to as "crown gold" and was used by the British Crown for centuries to make coins last longer, while still containing the requisite amount of gold. 동전 총중량은 1.0909트로이온스이며 동전은 999 또는 9999 순금은 아니지만, 1온스의 금을 포함하고 있습니다. 동전 뒷면은 아우구스투스 세인트 고든스가 전체적으로 연출한, 머릿결을 흩날리며 왼손에 올리브 나뭇가지를 들고 오른손에 횃불을 든 레이디 리버티입니다. 배경에는 국회의사당이 있습니다. 레이디 리버티를 떠오르는 태양과 50개의 별이 원모양으로 감싸고 있습니다. The words "LIBERTY" and the year are also on the face of the coin. 동전의 뒷면은 마일리 뷰식이 디자인했으며 올리브 나뭇가지를 물고 날아가는 숫독수리와 둥지에서 새끼를 품은 암독수리의 모습입니다. 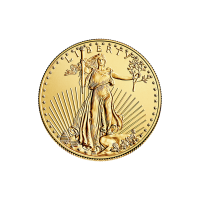 The words "UNITED STATES OF AMERICA" are featured prominently and the phrases "E pluribus unum" and "In God We Trust" are on either side and the bottom contains the weight, purity and face value, in this case "1/4 oz Fine Gold - 10 Dollars". 이 동전은 불리언 세계의 주요 상품이며 신뢰성의 상징으로, 세계적으로 가장 잘 알려진 불리언 금화 중 하나입니다.